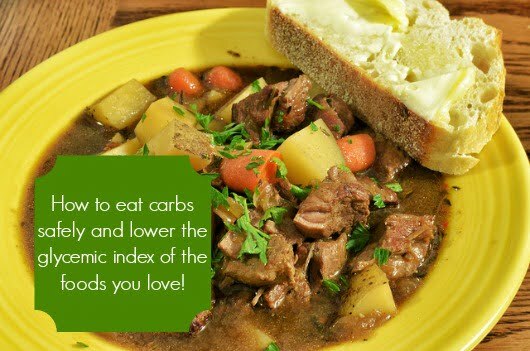 Would you like to know how to eat carbohydrates safely and how to lower the glycemic index of the foods you love? 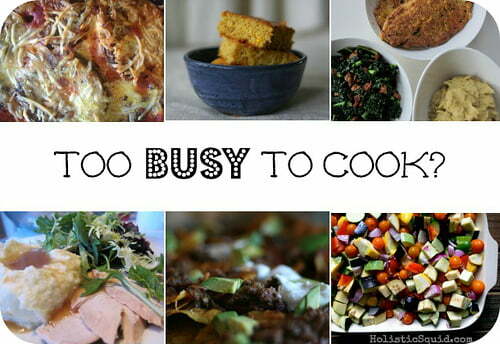 If you'd like to continue eating bread, potatoes, or other starches (and who doesn't?! ), then there are a few tricks to help you lower the glycemic index of these favorites. Why Lower the Glycemic Index? If you lower the rate at which the sugars in your food hit your bloodstream (this is called their “glycemic index”) and control the sharp blood sugar spikes they can cause, you are also minimizing the problems this can lead to, such as weight gain, nerve damage, stroke and cancer. Simple as that. These tips come from a book that I've learned a ton from, The Perfect Health Diet. While my conclusions differ from theirs some (and mine have evolved over the years quite a bit, too), mostly I agree with their recommendations. Of course I'm totally locked in with avoiding vegetable oils, those are disgusting and make me sick, too (literally). Read more about healthy fats here. You might think that the answer is to consume very few carbs. But this would be naive! It turns out that on low-carb diets, much of the body becomes insulin resistant – meaning that it doesn't respond to insulin signals and so doesn't take in glucose after meals. This happens so that glucose will be directed to the liver, where it can be stored in glycogen and released later for use by the brain. In short, low-carb dieting can increase the risk of postprandial hyperglycemia. THIS must be why it seems that any attempt at very low-carb dieting I've done in the past few years (to ‘lose a few pounds that have crept on') has led to gaining that AND a little bit more back on when I eat normally again! Anyone else experience this after low-carbing? Cook them gently. When starches are cooked in boiling water (as with home-cooked rice or boiled potatoes), their GI is fairly low, around 50-60: but when they are roasted at high temperatures, their GI often approaches 100. Avoid industrially prepared foods. To speed foods through factories, industrial foods are often processed at very high temperatures, raising their glycemic index. Commercial puffed rice or instant rice has a GI almost double that of home-cooked rice. Eat starches with vegetables. Including fiber in a meal significantly reduces the GI of accompanying starch. Vegetables are the natural way to add fiber to a meal. The effect of all these measures is to lower the GI of starchy foods by more than 50%. If starchy foods are gently cooked and eaten as part of a meal that includes vegetables, fat, and an acidic sauce, even diabetics can expect a low risk of postprandial hyperglycemia. 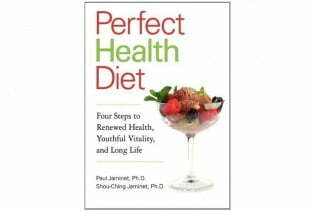 Click here to get The Perfect Health Diet. Low carb will increase insulin sensitivity NOT insulin resistance! Insulin triggers the uptake of glucose by the cells. If you constantly hit your body with carbs (high carb diet) then the production of insulin or response to it dulls after a while, think of the body getting bored ie resistant. With low carb the less frequent sugar spikes makes the cells more sensitive and alert to insulin making them better at taking up glucose. Glucose not taken up the cells (ie in a resistant system) will eventually be grabbed by the liver and converted to fat due to the apparent lack of need by the cells. This is correct to what my Doctor says. Can how you cook rice also affect the gi ?? Currently only use a rice cooker but open to ANY and ALL options to a lower gi rice thank you in advance? I’m not sure Niccii, but we love this rice sometimes (https://amzn.to/1OYZGr4) and I’m guessing the GI would be lower because it’s sprouted and so it’s closer to a plant than a grain. This all makes sense, and I generally follow these guidelines already. However, as someone with prediabetes it is not entirely effective, you still have to limit carbs!!! I’m currently on the Candida diet… No sugars or grains, or starches, or anything else I like :(… But weirdly, I have gained weight!!! This must be why. Grrr…. Why are some starches considered “safe”? Like rice? Because the GI can be lowered? You’ve probably gained some weight because your body is absorbing nutrients more effectively. Focus on more nutrient dense foods. A high fat, moderate protein, low carb PERMANENT dietary change will work wonders in your case. Ironically the way to blunt the impact of carbohydrates is by eating fructose. Fructose blunts the insulin response believe it or not. Just put the word paleo in front if whatever he wants to make. Watch for too much sugar though. I love this coconut pumpkin custard: https://www.freecoconutrecipes.com/index.cfm/2009/10/28/recipe-coconut-pumpkin-custard. Panna cottas are also a great option, or simple baked vanilla custards. All made with raw honey! You can often cut the sugars in a recipe. You can use natural substitutions sometimes. I’m thinking grandpa is not a young man and splurging on a holiday dessert may be a bigger blessing than overdoing the healthful aspect. So, make it a bit better but make it wonderful. Food is one of the few pleasures in life sometimes. I find that the sugar in most sweet recipes can be cut by 1/3 to 1/2 without affecting how the recipe turns out. Also, recipes in cookbooks written before the end of WWII tend to have a lot less sugar. It was expensive back then, and people weren’t yet acclimated to everything being overly sweet. Choosing desserts higher in fat and protein will help moderate any spike in blood sugar. Consider full-fat organic dairy based desserts (mouses, pudding, cheesecake,) or or use coconut oil or butter as a main ingredient (like with fudges, barks, caramels, pie crusts, or baked goods). There is an excellent recipe for raw choc mouse tart, made with nuts for the crust, and avocado and raw cacao filling it was so good and healthy!!! Ask him what is his favorite sweet treat. Then adjust it to less carbs. After reading PhD, I replaced our pepper shaker (salt and pepper were in a little basket my high school son gave me with chocolates 20 years ago) with a cruet of apple cider vinegar. We add it to starchy foods because it tastes good and is good for us. In fish and chips shops in England they always have malt vinegar for the chips. Some times I add quinoa to the rice thinking the fiber will slow down the GI, good or bad? I love quinoa and do have it once in a while. Okay question, so I like to cook rice by first frying it in coconut oil at around 6 on my stove, it’s an electric, so med high heat. In a separate pot I heat up water just under boiling and add it to the rice. Do you think this is a safe way of cooking rice or is there more healthy way that also tastes good? I recall Sally Fallon Merell recommending to put enough butter on your bread so that you can see your teeth marks in the butter after taking a bite of bread. Another reason to love Sally! Great article. I agree about the grains too…. But everyone is different. I remember hearing Dr. Oz talk about putting red wine vinegar in the spaghetti sauce for this reason.